David Haye is a fraud, a fake, a phony, a liar and a punk. David Haye took on Audley Harrison this past Saturday (Nov. 13) in the first all British heavyweight title fight in 13 years. Great, just great. Yet another fight no one could possibly care about for David Haye. Well, with the exception of England…maybe. After his 3rd round KO of a nondescript Harrison, Haye had the nerve to call out the Klitschko brothers, again. He has done this for 2+ years. He even had a fight signed to fight Wladimir, the younger Klitschko, and pulled out just two weeks before the scheduled date. Then he tried to bad mouth Vitali, the older Klitschko, into a match and it worked. Vitali responded and wanted to fight and was ready to set up a deal only to have Haye duck the fight before anything could get accomplished. Another fight was on its way to being signed with Haye taking on Wladimir and Wladimir even conceding a 50-50 revenue split. Yes, that’s as ludicrous as it sounds and yet the ducker of all duckers backed out, once again. It’s a joke, it’s a really, really bad joke. David Haye is pulling off the worst, most blatant case of ducking a fight that I have ever seen. It has to be in the top 10 all-time. I have never seen a case of one boxer (in this case Haye) talk so much trash and yet every opportunity they get to make a fight with the person they are talking all this trash about (the Klitschko brothers) and get a chance to back up their words only to punk out. But not just punk out once. It’s been over and over and over again. 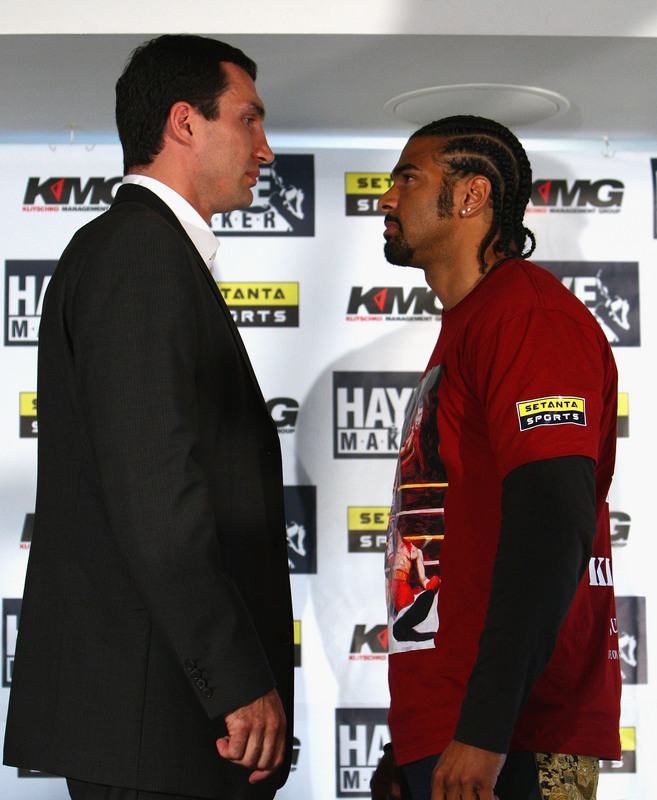 David Haye, for the love of God, please, please make a fight with either of the Klitschko brothers. Take one of these chances that they keep throwing at you and serving you up on a silver platter and do your best to back up your big mouth. I mean you should fight one of them if for no other reason than seeing one of the great Klitschko brothers literally punch your face off. It would be immensely enjoyed by me and many, many other fight fans. So ridiculous. Haye would be a nightly punchline in late night monologues Stateside of the Heavyweights had more exposure. I had hope for Haye. I really did. A talented, young, electric puncher joining the heavyweight division had me feeling hopeful for a great big heavyweight fight. It seemed he could be the type of foil the Klitschko’s needed, but this ducking and dodging he’s doing says volumes about him as a person and a professional boxer. At this point it would serve his career best to move back down to cruiserweight and take on the Marko Huck’s and Steve Cunningham’s of the world.